The work of Stefano Scarampella is now highly prized among the dazzling and often baffling array of late nineteenth and early twentieth century Italian makers, who revivified the spirits of the national tradition for the modern era. A close contemporary of Vincenzo Postiglione and Annibale Fagnola, both refined and diligent makers, Scarampella is known for his thoroughly muscular interpretation of the classical models. His career began in Brescia as assistant to his father Paolo and elder brother Giuseppe. Paolo was a carpenter and amateur luthier in Brescia of humble circumstance. Giuseppe was born in 1838 and fairly quickly embarked on a violin making career, working in Paris with Nicola Bianchi and later in Florence with Luigi Castellini, whom he succeeded as curator of the Cherubini conservatoire, which houses the surviving Stradivari masterpieces of the Medici quintet. 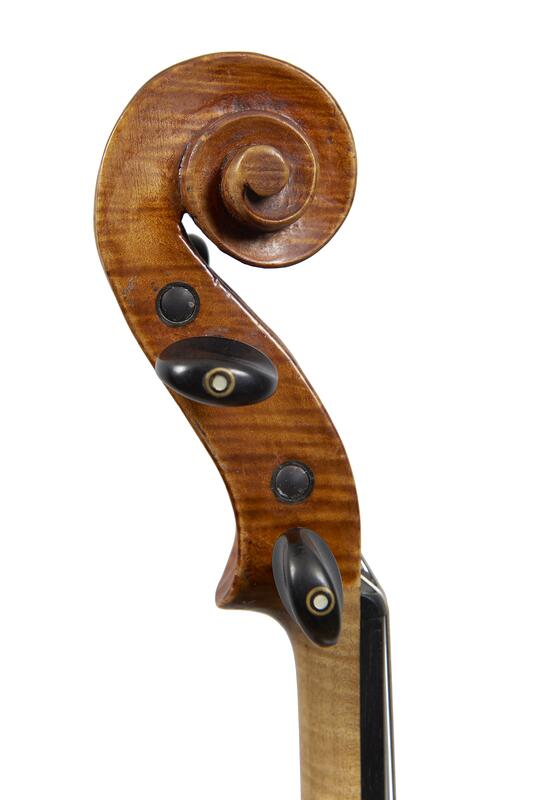 Stefano was born in 1843, five years younger than Giuseppe, and having spent his youth working with his father as a carpenter, only began making violins in the family workshop in Brescia in middle age, in about 1880. By 1886 he was working on his own account in Mantua, by which time Giuseppe had moved to Florence. His fully professional work came to maturity after 1902, when he inherited the tools of his brother Giuseppe who died in that year. From then on he devoted his time more fully to his robustly made instruments inspired by Stradivari, his predecessor in Mantua Tomasso Balestrieri, and Guarneri del Gesu. He was an energetic, instinctive and prolific maker, whose style was particularly suited to Guarneri. 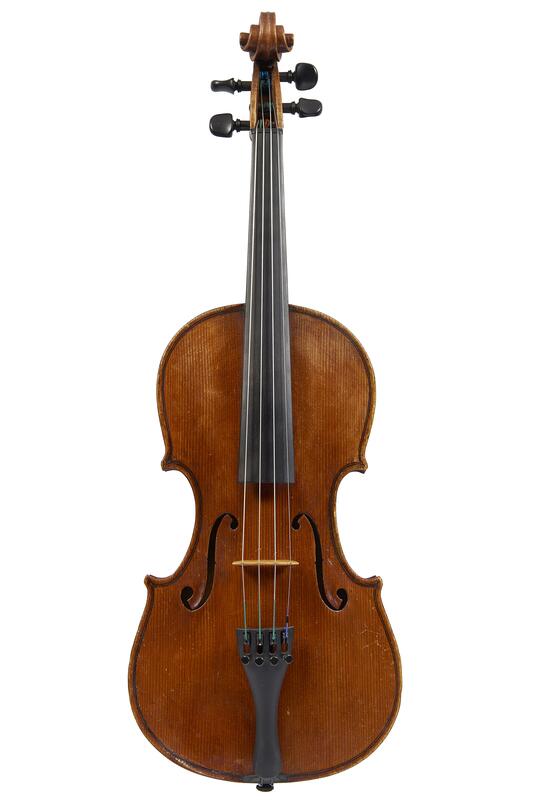 This 1910 example is from his best period and is very fine and characteristic, with a model reminiscent of the great ‘Cannone’ del Gesu of Paganini not only in the quickly hewn craftsmanship, but in the very bulk and weight of the instrument, which feels fully wooded and deeply resonant. The arch is low but full, springing powerfully from the flat edge, and a myriad scraper marks attest to the speed at which the whole violin was produced. The edge is not well regulated in thickness or profile, and the purfling follows it uncertainly, being quite broad and prominent, and a little unyielding in the curves. The head is almost brutal, carved with great energy and finished with the minimum of fuss, yet in its formal relation to classical models, maintains a powerful charm. Unlike the handsomely figured back of imported maple, the head is carved from the native Italian oppio, distinctive because of its tight, narrow figure and darker colour. It represents an interesting link with the older masters, all of whom used this material liberally, but which has now all but disappeared, and is never found in non-Italian work. The front has the appearance of mountain grown spruce and is of very broad grain throughout, which raises a slightly ragged edge to the swiftly cut soundholes. A simple gouge cut establishes the flute in the lower wing. It really is Scarampella’s varnish which visually lifts the whole instrument firmly into the upper ranks of the later Italian school. It has a fiery burnt orange colour that sits close to the wood, and appears as if it were laid on with a single broad brushstroke. It is very well preserved in this instrument, with a fine, clear texture, and a sparkle that distinguishes his work from the laboriously worked and polished sheen that many of his contemporaries and successors resorted to. Scarampella was aided and supported in later years by his pupil Gaetano Gadda. He never achieved great success in his own lifetime, and relied heavily on Gadda as his health declined after about 1915. He died in 1925, and Gadda continued to work in his master’s style, along with his son Mario Gadda, producing instruments that are often hard to distinguish from the originals, often bearing authentic labels left from Scarampella’s own workshop. Indisputably authentic and original violins by Stefano Scarampella are actually rarer than it might seem, despite his own hectic and bustling efforts, and of real and well-deserved value.